in the Serb village Donjna Bitinja in MNB East. Ten years after the fall of the Berlin Wall, several young countries from the former Eastern Block are contributing troops to the NATO-led peacekeeping mission in Kosovo. The four smallest KFOR contingents are all from the former Eastern Block. For the KFOR-personnel from Azerbaijan, Lithuania, The Slovak Republic and the Republic of Georgia, the 9th of November 1989 is a day they will remember for the rest of their lives. The citizens of Berlin, Germany, tore down the Berlin Wall, a hated symbol that not only divided the city, but literally the entire world. The fall of the wall was one of the most remarkable events in the last half of this century. It marked the end of the Cold War and the arms race between the two super powers, the USA in the west and the Soviet Union in the east. Nations which before 1989, belonged to opposite sides of the Berlin Wall, are now working side by side and using their military skills and resources to provide safe and secure conditions for the people of Kosovo. The year 1989 also marked the ascent of Slobodan Milosevic as President of Serbia. In a speech held at Kosovo Polje two years earlier, Milosevic told the Serb audience: "No one has the right to beat you." These words started what ended with NATOs air campaign last spring, which was followed by the entry of the Kosovo Force. Lithuania, a small and young nation that broke away from the Soviet Union, is one of the contributing nations to the Kosovo Force. The soldiers from the Lithuanian Army are dedicated to the Polish 18th Air Assault Battalion, located in MNB East. Their main tasks are guarding, escorting convoys, manning checkpoints and patrolling, as in the village of Donjna Bitinja, populated by Serbs. We also contributed with one platoon to the UNPROFOR mission in Croatia in 1994, as a part of the Danish Battalion, says Cpt Marius Kazlanskas, Liaison Officer to the Polish Battalion. "The difference in this mission is that now we have Polish leadership, but our own AOR, and accordingly more responsibility," he adds. Proud: The Azerbajani soldiers are very proud and disciplined. "I am happy to be here, because I am working in a Peace Force. I see success and results in this area", says 23-year-old 1st Lieutenant Fuad Memmedov, leader of the Azerbaijani platoon. 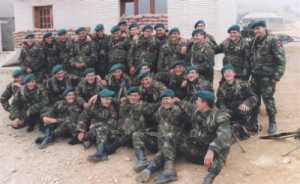 On 28 September this year the platoon entered Kosovo and became an essential part of the 4th Turkish Company stationed in the Centre of the Dragas village, 20 kilometres South of Prizren. "The Azerbaijani soldiers are fully integrated in our company, we speak the same language and work together hand in hand. We run three checkpoints and the patrol teams in the vehicles are mixed," says 1st Lt Fatih zkurt, Deputy Commander of the 4th Turkish Company. 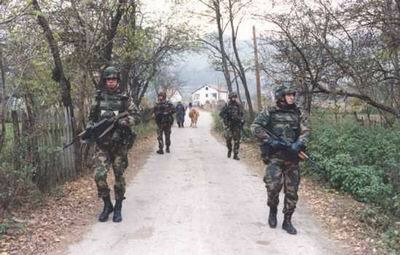 Together with their Turkish comrades the Azerbaijan soldiers patrol the area of Dragas, in addition to the boundary to Albania, where their task is to prevent people from crossing illegally into Kosovo. Both the Turkish and Azerbaijan personnel cater for themselves in a former restaurant in the middle of the village, in which they also are accommodated. 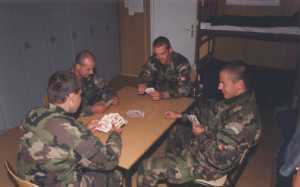 Work and play: SSgt Peter Dinga, Sgt Pavel Gajdos, Sgt Alexander Vilcinsky and Sgt Jaroslav Cernega from the Slovak contingent enjoy a game of Lora during their free time. At Camp Casa Blanca in Suva Reka outside Prizren is another small contingent, from the Slovak Republic. "We have a very good unit with professional soldiers from the Slovak Rapid Deployment Battalion. The Slovak Republic wants to become a member of NATO step by step, and this mission is one of those steps. We have experience from former UN missions and now we are getting experience from a NATO mission," says the Slovak Contingent Commander, Lt Col Ondrej Novisad. The Slovaks primary mission is engineer support for the Austrian Contingents HQ Coy of Task Force Dulje. Their tasks are mainly mine clearing, construction works and road repair. "We are a small country in KFOR, but our tasks here are very important." Lt Col Novosad says their work is very important, Because there are a lot of mine accidents here in Kosovo, and most of the victims are children. The Slovak soldiers are in good spirits, but admit that they are homesick, and that they long for their wives and girlfriends back in Slovakia. "We all volunteered to come here. We do it because of the money and to experience other parts of the world and to get to know people from other nations," says Sgt Peter Dinga. Good spirits: The Georgian contingent in KFOR are based at Mahmusa in MNB South. Georgia, another former Soviet Republic which became independent in 1989, has had its own army since 1991. It contributes to the mission in Kosovo with experienced personnel from the Special Forces. But here the Georgian soldiers are an integral part of the Turkish contingent at Mahmusa in MNB South. The Georgian soldiers are armed with Turkish weapons and wear Turkish uniforms. Only the flag of the Republic of Georgia and the military insignia on their uniforms are different. The Georgian soldiers task is run checkpoints alongside their Turkish colleagues and carry out patrolling. "In the beginning it was hard, because we talk different languages and have different traditions and religions. We are a small contribution to KFOR, but I believe that what we do is important for Kosovo," says the Georgian platoon leader, 1st Lt George Kupareshvili.